Konak Pizza and Grill Reviewed by Edgeville Buzz on November 30, 2010 . 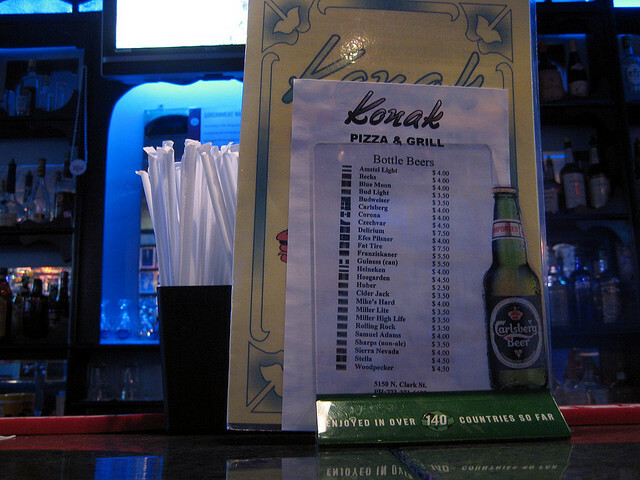 Several Fridays ago, we had the opportunity to go out for pizza and beer at Andersonville’s Konak Pizza and Grill. We arrived around 7:30, and there were a few people at the bar. It was apparent that Konak is a subdued and laid back place, which was somewhat belied by the large pool/darts area near the back of the establishment. We had a few domestic beers, and their selection is very good if that’s your thing. I tried an Efes, which is a Turkish beer I hadn’t heard of. It’s served in a tulip style glasses branded with the beer’s logo. Speaking of Turkish elements, Konak was established in 1988 as a restaurant serving Turkish cuisine. They’ve clearly evolved substantially since then. The menu includes some great variety, but we really wanted to try the pizza. The pizza itself is a style I haven’t encountered in Chicago-thinner with a rigid yet crisp crust, and cut into triangles. We ended up ordering a simple pepperoni version, which was very satisfying. The service and staff were prompt and friendly, and I imagine we’ll be back sometime soon.